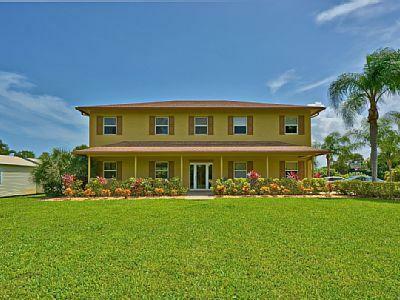 A Private Delray Beach Hideaway on 1.5 Acres. Rented for $7, 500 monthly. Unique hidden paradise on a privately 1.5 acres with heated pool. Your own electronic gate. This property was on VRBO for two years, every guest rated it five stars. It has been rented to a corporate client on a long term lease with a 90 day kick-out clause. It can be sold or new lease. If you like privacy, newer construction, close drive to the beach, heated pool, space for boats, RV's, businessvehicles or anything else like tennis/basketball court, this is it. The property was four lots, you can build another two houses or a guest house. The computer form has it awaterfront. It is a small canal that does lead to Lake Ida, but you can only do paddle boards or a kayak. Many options with this property. Development Name: This 1.5 Acre Gem Is It's Own Gated Private Devel.